The Brisbane River is home to the Turrbal and Yugarbul-Jagarra peoples who created pathways along the river valley linking ceremonial sites known as 'bora'. According to Kerkhove (1985:4) these pathways ran the length of the river and 'early settlers remembered seeing Brisbane Aboriginals marching in hundreds along these, or saw them tracking along them in South Brisbane at night with a blazing torch in one hand.' (cited in To Travel is to Learn, 2004). 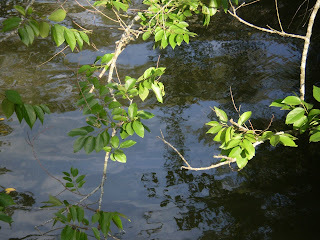 Then the river terrain was thickly wooded, swampy in places with many creeks flowing into the river. Wild fowl, fish and eel were plentiful, Bush Turkeys patrolled the undergrowth, Parrots flocked overhead, Pelicans fished the shallows while 'Ducks and [S]wans in their hundreds trawled the waterways' (Meston, 1923 cited in Kidd, 2000). This wondrous sight is a stark reminder of what has been lost. Kidd reports Aborigines in the mid-19th century being able to pull up fishing nets filled with fish in just 'a few minutes' (Bartley, 1896:247). This was the time when the river was clear, and even right up to the 1930s, there were accounts of being able to see the riverbed 5 to 6 metres below (Young 1990, in Gutteridge, Haskins & Davey, 1996). The abundance and natural beauty of the river has been irrevocably changed although swathes of its beauty remains, even in the heart of the city such as along the Mangrove Walk. But similar riverbank green spaces have been and are being burried under roadways, high rise development and economic progress. The spirit of this flowing place has been paved over but its spirit still thrives - in the memories, stories and rituals of the original custodians of this riverland and in the beauty of the river itself that flourishes despite an pro-development attitude that longs to smother its natural beauty. An example of the kind of thing that is happening along the river comes from a recent ABC Radio Eye program, 'Tree poisoning, weeds and Australian native plants: Watching the Trees'. The program explored the trend in some Sydney harbour-view suburbs of people poisoning trees that hinder residents' views of the water. As a result, local authorities have installed CCTV cameras to try to catch the tree vandals and erected signs warning of heavy financial penalties incurred for destroying local trees. Compare this action of seeing tree poisoners as vandals to the action of the local councils along the Brisbane River valley which allow unfettered tree felling in the name of development. Shade, amenity and beauty are sadly not often incorporated into urban planning decisions that affect both natural and community capital. Notions of beauty are all to frequently left out of discussions on resource management and sustainability. So a development or environmental change might be deemed sustainable even if the natural beauty of a place is destroyed. The sylvan riverscape continues to be threatened to some extent, perhaps, because non-Aboriginal resource users and managers may not take heed of river stories told by Aboriginal people and by the river itself. This frame of reverence is sadly outside the domain of non-indigenous concepts of sustainability and environmental and social impact assessment. Reverence, honour, respect, beauty - the incorporation of these values would shift resource management practices on land and sea to a different kind of awareness and action. These are essential truths. Sacred values are rooted in the land and in relationship with kin and country. These sacred values are embedded in the tidal exchange of fresh and salt waters in the flowing beauty that is the Brisbane River. Bartley N, 1896, Australian Pioneers and Reminiscences together with portraits of some of the founders of Australia, Gordon and Gotch. Gutteridge, Haskins & Davey Pty Ltd, 1996, Task M2 State of the Brisbane River and Moreton Bay and Waterways Brisbane River Management Group, Brisbane River and Moreton Bay Wastewater Management Study, Working Draft Version 1.4. Kerkhove R, 1985, West End to Woollangabba: The Early Aboriginal History of the District, Brisbane, Foundation of Aboriginal and Island Research and Action. Kidd R, 2000, Aboriginal History of the Princess Alexandra Hospital Site, Diamantina Health Care Museum Association. Meston A, 1923, ‘100 Years - Black Man to White Settlement’, The Daily Mail, December 1, 1923. Pearson N, 1995, 'Cape York Peninsula: the land needs its people,' Paper presented to the Wild Agendas Conference, Sydney University, July, 1995.